With Middle-earth firmly in the past, VIGGO MORTENSEN looks to a future of indie art, father-son bonding, and learning A HISTORY OF VIOLENCE. During production on David Cronenberg's thriller A History of Violence last fall, Viggo Mortensen carried around a fish - a 12-inch, anatomically correct plastic trout. It was a peripheral prop, a toy brought in for his character's young daughter, but Mortensen decided to adopt it as a secret talisman of sorts. Every day, he tucked it into his back pocket, his cowboy boots, his bag, anywhere that was out of Cronenberg's sight. "It was like a compulsive thing after a while," the actor explains. "I felt like it was unlucky not to have the trout, so I would sneak it in. It became this game to see if I could keep getting away with it." He did - until the last day of shooting, when his finnish friend fell out...on camera. Says Mortensen, with just a touch of mischievous pride: "David saw it and was appalled." Welcome to the quietly eccentric world of Viggo Mortensen, a man who quotes British philosophers and Adam Sandler in the same breath; who publishes his own poetry, artwork, and music; and who, after starring in one of the biggest epics of all time, is still more comfortable walking barefoot in the dirt than strutting down a red carpet. His turn as Aragorn in the Lord of the Rings trilogy made him an international star, but he has resisted trying to parlay that popularity into a matinee-idol career. "I've never really had a certain set of goals," the 46-year-old Mortensen says between bites of fish-and-chips at a low-key Irish pub in L.A. "I think it's the same as [wanting to be] happy or in a relationship. It's just something you have to find by being open and not planning. So you read scripts, and every once in a while, something comes your way." A twisty drama infused with the kind of dark humor we've come to expect from the director of Dead Ringers and Naked Lunch, Violence seems tailor-made for Mortensen's sensibility. "If David hadn't been directing it, I don't know if I would have wanted to do it," says the actor, who stars as Tom Stall, a husband and father whose small-town life is upended by revenge-seeking mobsters. "I don't know if another director would have explored the violence of everyday coexistence." When the movie premiered at the Cannes film festival last May, it got a passionate standing ovation, with audiences heaping praise on Mortensen. Though not the highest-profile project he has taken on post-LOTR (that would be 2004's big-budget horse-racing underwhelmer Hidalgo), it is arguably the most mature of his career. "It's ironic that Lord of the Rings is what made him a star, because it's not his most complex role," says Cronenberg. In casting the lead, the director needed someone who could bring both a commanding force and familial gentleness to Tom Stall, and as far as he was concerned, Mortensen was it - period. "Viggo has the charisma of a leading man, and the eccentricity and naturalistic presence of a character actor," Cronenberg says. "He's the kind of actor I love." Mortensen speaks slowly and softly. When he answers a question, he takes his time, peppering his replies with lots of thoughtful I supposes and mmms. Humble and unassuming, the man whom Rings pals nicknamed "no-ego Viggo" does not much care for being the center of attention. "He's not full of his own s---," notes Violence costar Ed Harris. "Which is so refreshing. He doesn't let the pressure of people wanting to pump him up into something get to him. He works hard, and is just a really good man." At lunch, Mortensen is constantly steering the conversation away from himself, onto any number of topics, including Canadian ice hockey (he's a fan), the Bush administration (not a fan), and the sophisticated sense of humor of Maria Bello, who plays his wife (major fan). His rugged handsomeness - high cheekbones, icy blue eyes, strong chin - is the No. 1 topic of many a fawning website, but he is, as Cronenberg puts it, "blissfully unaware of how attractive he is." When asked for his opinion on the matter of his physical appearance, Mortensen just seems puzzled. "Um...," he begins. "I don't think it's the main thing that people mention or think about when they're talking about me." 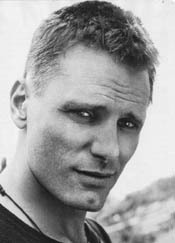 The eldest son of an American mother and a Danish father (Viggo senior), Mortensen was born in Manhattan in 1958. He spent years 2 through 11 in Argentina, Venezuela, and Denmark; following his parents' divorce when he was 11, he moved to northern New York with his mother and two younger brothers. His itinerant childhood gave him the gift of multilingualism (he speaks English, Spanish, and Danish "all about the same" and can "get along okay" in another five languages) and ignited in him an intellectual thirst, a desire to gulp down as much as he can while on earth. "It made me more curious...about the world, and interested in different ways of looking at the exact same situation," he explains. "All of which are helpful to an actor." He tries, for instance, never to watch the same film twice. "You can spend your whole life looking at movies made outside the United States [alone] and never see them all," he marvels. There is at least one exception to this rule, however: Adam Sandler's 1996 comedy Happy Gilmore, which he will watch any day, any time. The very mention of it makes him launch into his own Sandler imitation, which isn't half bad. "It's just one of those charmed movies," he says. As a child, Mortensen was constantly dabbling in some form of artistic expression. "I always drew, like most kids do," he recalls. "As a teenager I started taking photographs and writing little stories and poems." A shy boy who "would have been terrified" to join the drama club, he did not even consider acting until after graduating from St. Lawrence University in 1980 with a degree in Spanish literature and government. When the idea did occur to him, it was more out of curiosity than ambition. "It was something I wanted to try," he says, citing Meryl Streep's performance in The Deer Hunter as an inspiration. "Just from seeing movies and wondering how people did it, how they made something seem so believable - what's the trick?" In the early '80s, he took drama classes in New York and was soon living the life of an aspiring actor, enduring the "usual rejections and frustrations." His very first roles--in Woody Allen's The Purple Rose of Cairo and Jonathan Demme's Swing Shift - ended up on the cutting-room floor. But he kept on, scoring a small part as an Amish farmer in Peter Weir's 1985 drama Witness. Mortensen has only a few minutes of screentime - watch his fresh, 25-year-old face size up Harrison Ford at the picnic table - but it set off something inside that persuaded him to keep going. "The same day I was offered Witness, I was offered a Shakespeare in the Park production--I think it was Henry V," he recalls. "I made a choice to try something I didn't know much about, which ended up being the right thing, because it was a good story and I got to work with Peter Weir." But, he concedes, "I was probably spoiled by having that as an initial experience." It's true, his resume from the subsequent years reads like a Sunday-afternoon cable-TV guide. In 1987, he appeared in the televangelist satire Salvation!, where he met his future wife, punk chanteuse Exene Cervenka of X, with whom he had a son, Henry, in 1988. (The couple later divorced.) More stinkers followed (Leatherface: The Texas Chainsaw Massacre III, Young Guns II) until 1991, when Sean Penn cast Mortensen as a volatile Vietnam vet in his directorial debut, The Indian Runner. "He was dazzlingly committed all the time. He literally brings the kitchen sink for a character," says Penn, who delighted in seeing Mortensen arrive on set each day with a "Santa Claus sack" full of various props he'd chosen. "He's an often solitary, very poetic creature, Viggo, and all of that worked [for the movie]." 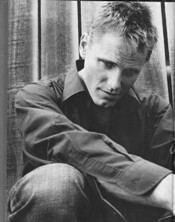 Mortensen's critically hailed performance led to more memorable collaborations with directors like Brian De Palma (Carlito's Way), Jane Campion (The Portrait of a Lady), and Ridley Scott (G.I. Jane). Then, in the late '90s, he smoldered opposite Gwyneth Paltrow (A Perfect Murder) and Diane Lane (A Walk on the Moon). Still, he hardly had job security. "I'd be the first to say that out of close to 40 movies, most of them you wouldn't consider anywhere near really good," he admits. "But that being said, I don't think my career is that unusual. Very few actors can string together an incredible list of [hits]. I've been lucky to make a living for quite a while at it." Mortensen has no regrets about any of his film choices, opting, as he often does, to focus on the positive. "I wouldn't put any of 'em down. There's always been something good about each situation," he reasons. "I've had a part in telling interesting stories - some not so interesting - and I've met a lot of interesting people." While grateful that The Lord of the Rings has opened doors for him professionally - he is, after all, headlining major movies for the first time in his career - he would never trade his years of working comfortably under the radar for a shot at earlier fame. "If that had happened to me, I don't know how I would have dealt with that," he says. "The weird attention is troubling enough now; 20 years ago, it would have been too much." Long after lunch has been cleared away, and the dinner crowd starts trickling in, Mortensen orders a cup of black coffee and talks about how much he's looking forward to settling back into his quiet life in L.A. with Henry. He's just returned from Madrid, where he shot the Spanish-language period drama Alatriste, in which he stars as a 17th-century "sword for hire." He considered doing another film in Spain, Teresa, starring Paz Vega, but with Henry entering his final year of high school, Mortensen ultimately declined. Father and son are very close, sharing what the actor calls a "pals relationship...I just need to be home with my son," he says. Before Middle-earth mania, few paid much attention to Mortensen's extracurricular activities. Now his books are in multiple printings, and his exhibit openings are packed with fans hoping to catch a glimpse of their beloved Aragorn. Which doesn't bother him at all. "It doesn't matter why people come," he says. "I know some people could look at it and say, 'Well, they're not taking me seriously.' But they're there, and are either going to like it or not, so what's the difference?" So he's not pounding his fist, demanding his true-artist's respect? "There's a quote that I like from the philosopher Bertrand Russell," he says, narrowing his eyes pensively. "'One of the symptoms of approaching nervous breakdown is the belief that one's work is terribly important.'" He stops, clapping his hands and letting loose a great big guffaw. "It's perfect!"